^ Cabinet Ministers. Government of Oman. [13 October 2010]. （原始内容存档于22 December 2013）. ^ Final Results of Census 2010 (PDF). National Center for Statistics & Information. [7 January 2012]. （原始内容 (PDF)存档于18 May 2013）. ^ 4.0 4.1 4.2 4.3 Oman. International Monetary Fund. ^ Oman. MSN Encarta. （原始内容存档于1 November 2009）. In 751 Ibadi Muslims, a moderate branch of the Kharijites, established an imamate in Oman. Despite interruptions, the Ibadi imamate survived until the mid-20th century. ^ Kharusi, N. S. The ethnic label Zinjibari: Politics and language choice implications among Swahili speakers in Oman. Ethnicities. 2012, 12 (3): 335–353. doi:10.1177/1468796811432681. 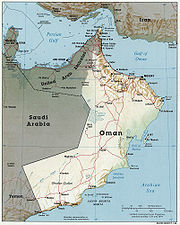 ^ 9.0 9.1 Country Report: Oman. BTI Project. 2016 [19 August 2016]. 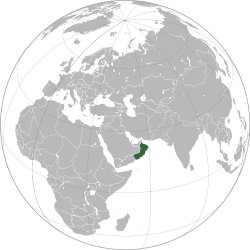 ^ Arab uprising: Country by country – Oman. BBC News. 2013 [29 December 2014]. 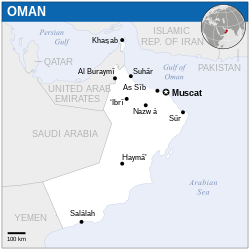 ^ Oman profile – Overview. BBC News. 11 September 2012 [18 January 2013]. ^ Private sector gets Omanisation targets. Gulf News. 13 February 2011 [18 January 2013]. ^ Five Arab states among top leaders in long-term development gains. Hdr.undp.org. 4 November 2010 [29 October 2011]. （原始内容存档于9 November 2013）. ^ Global Peace Index: 2017 (PDF). visionofhumanity.org. 全球和平指数 and 经济与和平研究所: 11. [5 December 2017]. ^ 16.0 16.1 世界概况. The World Factbook OMAN transportation. 中央情報局. [2015-11-01].